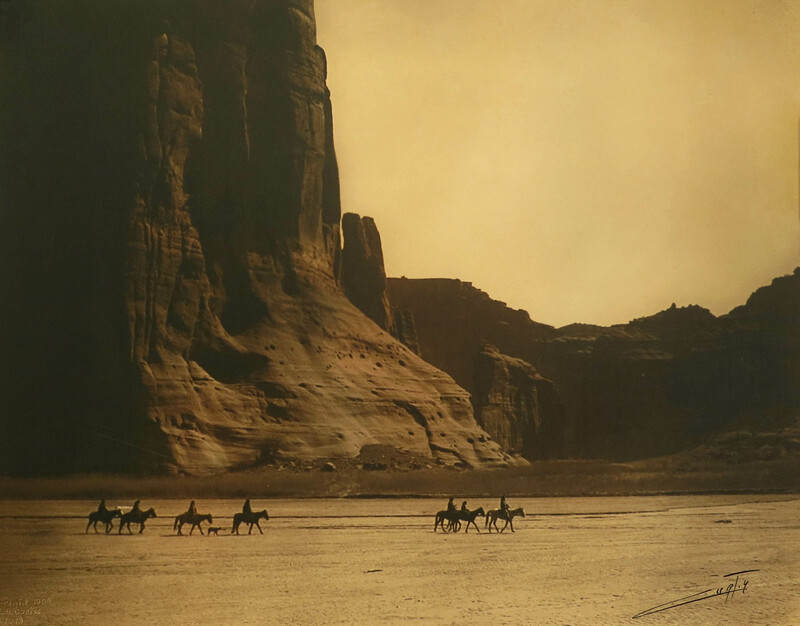 Valley Fine Art presents two of Edward S. Curtis’ most seminal photographs, Canon De Chelly and An Oasis in the Badlands, both traditional gelatin silver prints. Both images were, in fact, included in Curtis’ magnum opus, The North American Indian: Canon De Chelly is Plate 28, photographed in 1904 and An Oasis in the Badlands, Plate 80, was photographed in 1905. Despite the fact that silver printing was the most popular photographic printing process of the past century, Curtis printed in it rarely. 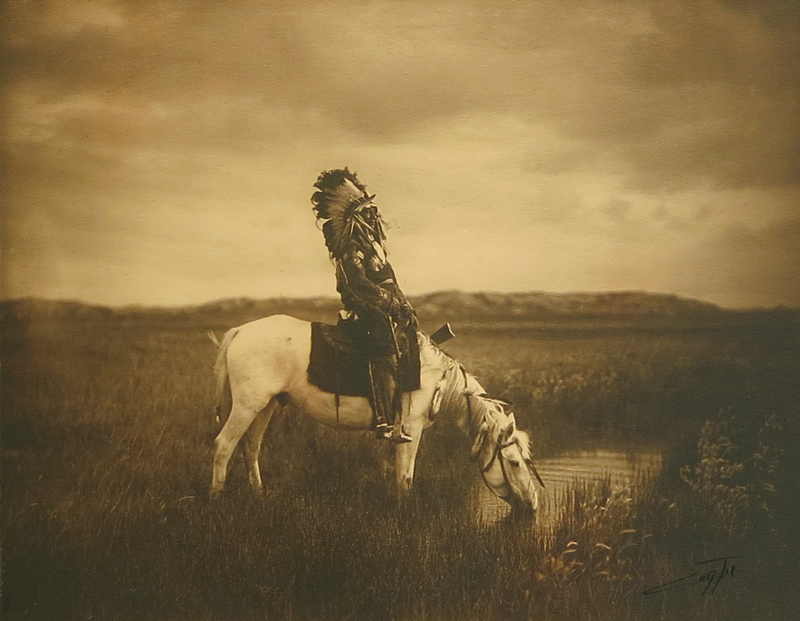 In fact, The North American Indian on the whole consists entirely of photogravures, which in their own right garner much attention for their unique color, texture and depth. In the early 20th Century, photogravure was the Cadillac of printing processes for publication of images – it made sense, and for Curtis, reproducing his photographs as photogravures in bound volumes and accompanying portfolios was a logical choice. Signed: L.R., Blind stamped: L.L. Gelatin silver prints, both photographically and artistically, are a different animal altogether. Silver prints are made by enlarging the photographic negative or plate in an enlarger – and exposing light through the negative image onto a photographic paper in the dark. The paper itself is coated with an emulsion of silver salts in gelatin and when processed in photographic chemicals, the substrate reveals a latent image on the surface of the paper. Of course this a very basic definition of the process but what’s unique here is that silver printing requires the photographer’s hand at every turn and Curtis’ silver prints show extraordinary technical prowess over the medium. The gelatin silver process was introduced only in 1871 by Richard Leach Maddox and already Curtis is an undisputed master of the medium. Curtis’ “master prints” (Gelatin Silver Prints and Platinum Prints) are less than 1% of all of the work he created and left behind. These prints were made for both exhibition and sales to patrons and were made by Curtis himself. It is hard to quantify exactly how many silver prints of each image have surfaced because Curtis didn’t document how many he printed. We would estimate we have seen or known of an estimated 25 silver print examples of each image to have surfaced, but let’s over-estimate and say there are 50 total (various sizes). These prints are very rare indeed. I invite you to visit the gallery and see the piece in person.